SSE organizations from 13 Latin American countries have come together for an economy founded on economic and social relations of cooperation between human beings and between human beings and nature. 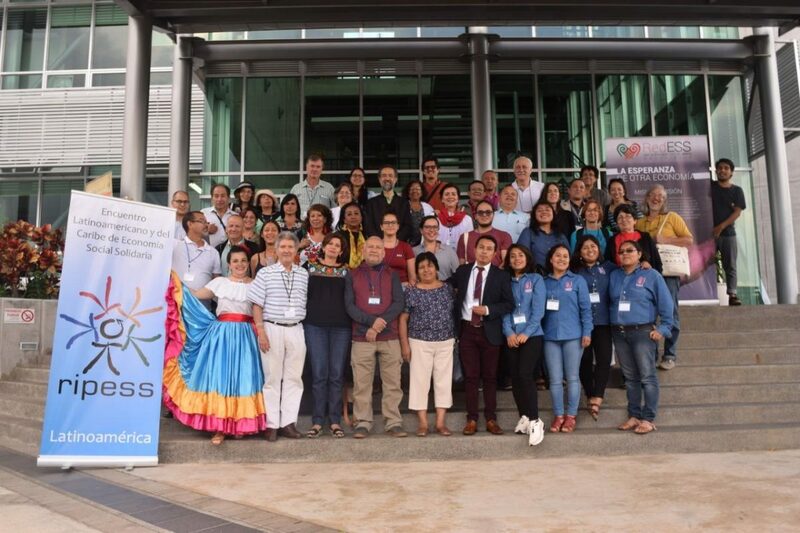 From February 27th to March 2nd, the 7th Latin American and Caribbean Meeting on Social Solidarity Economy, promoted by the Network of SSE RIPESS LAC, was held at the National University of Costa Rica (UCR), San José de Costa Rica. The objective of the event was to reactivate and update the organizational approaches and strategies for the promotion of the Social Solidarity Economy (SSE). The event aroused great interest among SSE organizations and projects in Latin America. 13 countries of the region were represented with members of organizations and institutions that promote another economy in the region, centered on the interests of the people and rather than capital. The keynote presentations, workshops and plenary sessions addressed different topics such as: agroecological production, responsible consumption and territory, ethical finance, feminist and gender equity, fair trade, self-management and economic equity, among other aspects. They were all addressed in a dynamic exchange of knowledge and enriching experiences. A critical analysis was carried out within the framework of new horizons for SSE of the factors that determine the “senility” of global capitalism and how this favors a new society, the dispute for the control of common and public goods and the opening of an economic, political and social democracy, the current state of the solidarity economy, alternative currencies and their role in the construction of sovereign territories. During the inaugural ceremony, the Rector (E) of the UCR stated: “We recognize the contributions of SSE to the historical-cultural construction of actions and struggles, your efforts as producers, as producers of power and knowledge and we join in the participative democratic management for the common good”. Reaffirm SSE as another way of doing economy, centered on people and in harmony with nature. Recover and strengthen community practices of reciprocity and cooperation. Build processes of empowerment of SSE initiatives in the process of public policy formulation. Strengthen the processes of integrated and sustainable territorial development at the national and global levels. Promote Latin American and Caribbean regional integration, privileging peace and self-determination. Defend respect for the pluricultural, multi-ethnic and multilingual character of peoples, revaluing their ancestral knowledge and their socio-economic, solidarity and reciprocal contributions. Promote gender equity practices and policies in an active and sustained manner. Deconstruct the coloniality of power in the spheres of knowledge, economy and politics. Avoid extractive industries and the privatization of common goods. To this end, the participants have committed to broadening integration and dialogue among the different actors of SSE, together with other related and transforming movements. In addition, they have also decided to work to identify instruments, methods and systems that improve the levels of economic and social efficiency of solidarity enterprises, their products and services, with the aim of improving the quality of life of their members and communities. Parallel to the 7th Meeting, the Assembly of RIPESS LAC took the opportunity to meet and elaborate the Work Plan for the 2019-2020 period. During the Assembly, the Regional Directing Council (RDC) was designated; it will be chaired by Nicolás Cruz from the Dominican Republic, with Relinda Sosa from GRESP (Peru) as Vice-coordinator and Alfonso Cotera as Technical Secretary. The thematic Commissions that were established and will function from now on are: Organization, Education, Gender and Equity, Solidary Economic Circuits, Communication and Advocacy.